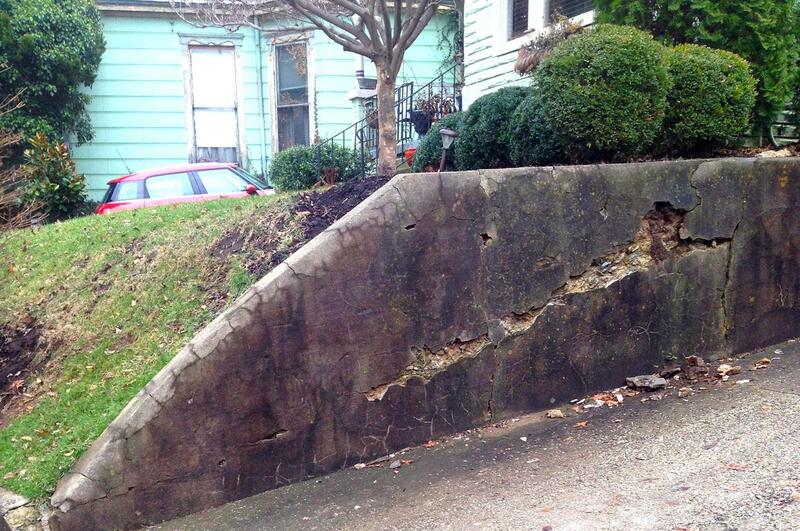 DEAR LYNN: I’m glad you sent me multiple photos of the retaining wall. Based on your photos, I’m happy to tell you that there’s no danger to your home. It’s my feeling the contractor was trying to take advantage of you. While the wall looks to be in fairly bad shape, it’s still doing a great job of holding back the soil behind it. The first thing I noticed in your photos is the wall is not leaning at all toward your neighbor’s driveway. This is a good thing, keeping in mind the wall is as old as your home – close to 100 years old. Before we talk about how you’re going to repair the wall, let’s spend a moment discussing the contractor’s unethical conduct. By painting a picture in your mind of how you’ll have to repair your house foundation as well as the retaining wall, he was making you feel your savings account money would soon be scarce. I loathe contractors that try to scare homeowners. To verify if a contractor is telling the truth about retaining walls, foundation walls, bearing walls or other structural things in your home that terrify you, consult with a residential structural engineer. An engineer doesn’t have a dog in the fight. This professional will visit your home and render an opinion as to the structural soundness of whatever you ask him to look at. If a repair is needed, most engineers will develop a plan you can use to get competitive bids from contractors. What’s more, most engineers have a list of honest contractors they recommend. Here’s how I’d go about adding another 30 or 40 years of useful life to your retaining wall for about $100 worth of material. It’s a pretty simple two-day job for two men. Since I’m not familiar with labor rates in your city, I can’t quote you what it might cost, but it’s not going to be much at all. If you have moderate DIY skills, you can do this job yourself. All you need to make the repair is a bag or two of Portland cement, a bag of hydrated mason’s lime, some medium sand and rounded pea gravel. You’ll also need a few 6- and 9-inch pieces of 1/2-inch steel rebar, a hammer drill with a 1/2-inch bit and a 4-pound hammer. The first thing to do is clean the wall. Based on your photos, the wall is covered with algae and black mildew. You can pressure wash it or you can use a solution of oxygen bleach. The wall needs to be clean because the last step of the repair will be a thin coat of stucco that will really dress up the wall. Once the wall is clean, remove any loose material in the deep holes. Just scrape away and try to get anything out that will move with hand pressure. The next step is to install the short pieces of steel in the deep holes to help bond the repair concrete to the old. Using the hammer drill, you’ll drill down at an angle into the old concrete. Drill the holes at least 4 inches deep. Hammer in the short pieces of steel rebar so the end of each piece is at least 3/4 inch inside the outer face of the wall. The large holes are filled with a stiff mix of pea-gravel concrete. I’d mix 3 measures of pea gravel, 2 measures of medium sand, 1.5 measure of Portland cement and 0.5 measure of the hydrated lime. The lime helps to make the mix very sticky and also is a magic material that continues to grow crystals for years after it’s installed. Add just enough water so the mix resembles mashed potatoes. Before you add the concrete mix to the deep holes, you need to mix up a batch of cement paint. Blend three measures of Portland cement to one measure of the lime. Add enough water until it resembles paint. Spritz the holes that need to be repaired with some water and immediately brush on the cement/lime paint mixture. Immediately cover this paint with the pea gravel concrete so it’s flush with the existing face of the wall. The last step is to put a thin 3/8-inch coat of stucco over the wall. Mix up a fresh batch of cement/lime paint. The stucco mix will be 5 measures of sand, 2 measures of Portland cement and 0.5 measure of the lime. Add just enough water so the mixed stucco resembles a moist applesauce. Slightly dampen the wall, paint on the cement/lime paint and cover it with the stucco. Don’t let the cement/lime paint dry. You must cover it with the stucco within minutes of brushing it on. Use a wood float to give the stucco a nice swirl finish and sit back and enjoy the fruit of your labors, or that of the contractor you hire. Published: Feb. 4, 2017, 10 a.m.